Male hartebeest strenuously defend their territories; they often stand on open, elevated areas to keep a lookout for intruders. Should a territorial male be challenged, a fight may develop. 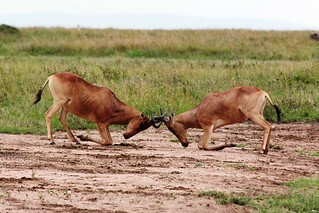 The hartebeest with its stout horns, short, strong neck and heavily muscled shoulders, is well-prepared for fighting. If the dispute over a territory is serious and both males are prepared to fight over it, severe injury may result.